Intimate child-friendly, Founders Camp is ideally situated to provide an insider’s view of the secrets of river life. 10 idyllic chalets, repose in the shade of ancient ebony and matumi trees along the banks of the Sand River. The rooms have been designed to accommodate families with a convertible children’s room. 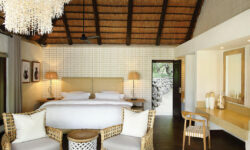 This is an African safari in the classic style, replete with black and cream ticking fabric and original mahogany beds. Deep leather couches, military chests, compass safari lamps and a riverside lounge sala, create a mood of easy luxury and laid back welcome for discerning families and travellers. Founders Camp is also home to the Londolozi yoga deck, a wonderful sanctuary suspended high in the arms of a 500 year old ebony tree.